No one has dominated a course like Tiger Woods has tamed Torrey Pines, with eight professional wins there. Here's a rundown of Tiger's Torrey victories, with testimony both from the man himself and from witnesses to the executions. 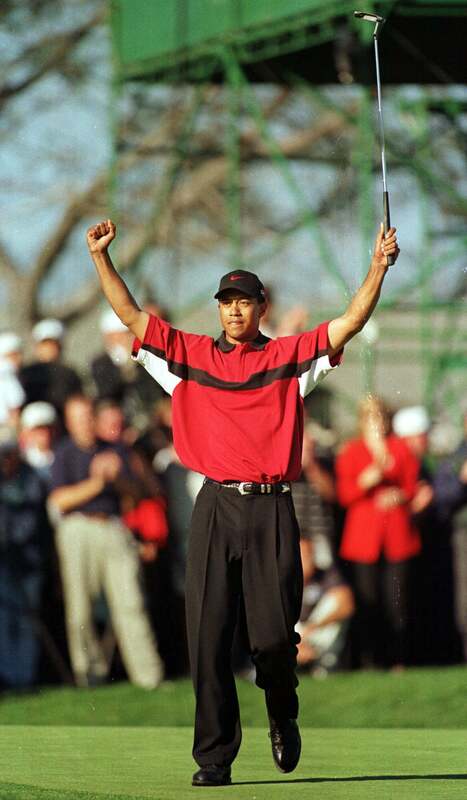 At the '99 Buick, Woods made the cut by only two, then, after a Saturday 62, held off Billy Ray Brown with a 15-foot eagle putt on the par-5 18th for a final-round 65. BILLY RAY BROWN: "Tiger and I separated from the field, and it became like match play. Really fun. We laughed all day. Tiger will stare you down like Ray Floyd, and when I made birdie at 16 I stared at him, and he stared at me, and we just cracked up. He loves that stuff. He was in the cabbage on 17 and I thought I had him. But he hits this miraculous shot, and a clump of grass comes out — you could sod half a football field with it — and he gets up and down. We go to 18 dead tied. I rip a good drive. Then Tiger hits, and his drive sounds like a cannon exploding. He hits it 90 yards past me! He has so much extra in the tank. He was close to the green, which forced me to play a hook. I hit it so fat — I hit the big ball before the little ball. I made par, and his eagle putt went in like a rat diving into a hole, as his putts always seem to do. Incredible." Three months after surgery on his left knee, Tiger beat Carl Pettersson by four shots and Brad Faxon by five. BRAD FAXON: "Tiger had just come back from knee surgery, and Sunday was the first he and Phil had been paired together since Phil made the comment that Tiger wasn't using good equipment. I was like the referee — I was in second, Phil was third. It was absolute mayhem on the first tee with the camera people — it seemed like there were more people inside the ropes than outside. Tiger put on a clinic. It was just great shot after great shot. On the 11th hole, the par-3, the pin was in the top-left portion of the green and he hit a 4-iron, the purest, most beautiful shot. My caddie actually grunted when he hit it. Kind of like, holy cow! The ball never left its target and ended up a foot from the hole." Woods edged Luke Donald and Tom Lehman. Due to fog delays, Lehman played 36 holes in one day with the then-World No. 1. TOM LEHMAN: "The reason he's so dominant there is that the course is long and has severe green surrounds. If you miss the green you need an imaginative short game. He didn't hit every shot perfect, but he bailed himself out with his putter and his short game. The purer you roll it, the more you distance yourself from everyone else on bumpy greens. It's the guys who mis-hit putts who struggle." LUKE DONALD: "He holes more putts at Torrey Pines than he usually does, even when the greens aren't in that great of shape." Woods' final-round 72 in '06 left him "very lucky" to make a playoff with Nathan Green and Jose Maria Olazabal. Olly missed a four-footer to hand Tiger the trophy. TIGER WOODS: [on Olazabal's missed putt]: "You don't ever take joy out of seeing friends do that." NATHAN GREEN: "He plays the South just as well as he plays the North. Every course suits him, but [the South] more than most because he's such a good long-iron player. And he seems to putt well on those greens." Despite finding 16 bunkers in the last two rounds, Woods beat Charles Howell III to win by two — his third straight Buick Invitational win. CHARLES HOWELL III: "The course requires a lot of drivers, so his length is an advantage. Also, you're just not going to hit every green out there, because [Torrey Pines South] is such a ball-buster — it's so long and tough, and that's where his short game comes into play. The course sets up perfect for him and his scoring ability — the guy can get the ball up and down and make par from nowhere. He's always hanging in there, and he has that ace in the hole: his putter. The greens are always bumpy, but it doesn't matter." Tiger finished 75th in fairways hit — and won by eight. Woods played with then-rookie Kevin Streelman on Saturday. Boo Weekley was in the mix before a Sunday 77. KEVIN STREELMAN: "I'll never forget the shot he hit into 11 [a 221-yard par-3] — I tell everybody about it. Mike [Streelman's caddie] and I were thinking, He's got a huge lead, he'll hit 5-iron to the middle of the green. But a 5-iron would have sucked back and ended up at the front of the green. So he hits this hold-cut 4-iron, gripping it down by the steel, that hung on the left side of the pin and hit up on the top of the back shelf, which killed [the spin] enough that it released back and almost went in. It caught the left lip and ended up two feet away. I mean, nobody goes for that pin; long is dead. It was like he was just having fun." BOO WEEKLEY: "I think Tiger should have to play with just a 2-iron." In an epic victory, a limping Woods — playing with a torn ligament in his left knee and a double stress fracture in his left tibia — outduels Rocco Mediate in a thrilling 19-hole Monday playoff. It's Tiger's 14th major victory and may go down as his most dramatic. ROCCO MEDIATE: "I woke up feeling great [on Monday]. I knew I was gonna play well. I thought I was gonna win the U.S. Open. I was NOT just happy to be there, to lay down. When we were done, after the 91st hole, he said, 'Great fight.' I said, 'You, too — enjoyed it.' Nothing fancy. He was different that day than in other tournaments. No fist-pumps. There was something special happening. He was into it. He got a great battle, and I'll bet he enjoyed it more than if he'd won by 10." TIGER WOODS: "It was just unreal. Roc looked like he was in control. I thought I was in control, then he was back in control again. And it was back and forth, back and forth. And 90 holes wasn't enough. We had to go one more." KENNY PERRY: "He beat everybody on one leg!" Woods' last victory at Torrey Pines was not one to be overlooked, despite a sluggish 11 holes on Monday. Woods had a six-stroke lead going into the delayed fourth round on Monday. With seven pars, two bogeys, one double-bogey and one birdie, he ho-hummed his way to his 75th professional win, after having torched the field on Sunday. TIGER WOODS: "It got a little ugly toward the end. I started losing my patience with the slow play. I lost my concentration a little bit." HUNTER MAHAN: "I think he wanted to send a message. I think deep down he did. You play some games to try to motivate yourself. There's been so much talk about Rory [McIlroy]. Rory is now with Nike. That would be my guess. [Tiger] looked strong. He had great control of his swing. He was hitting some strong shots, different from any other player I saw out here."